The P wave, which represents atrial depolarization, is a small positive (or negative) deflection before the QRS complex. One of the most confusing aspects of electrocardiography . The QRS complex represents the spread of a stimulus through the ventricles. 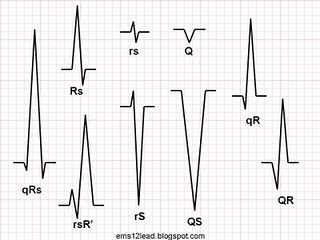 However, not every QRS complex contains a Q wave, an R wave, and an S wave--hence the confusion. The bothersome but unavoidable nomenclature becomes understandable if you remember several basic features of the QRS complex . When the initial deflection of the QRS complex is negative (below the baseline), it is called a Q wave. The first positive deflection in the QRS complex is called an R wave. A negative deflection following the R wave is called an S wave. the entire complex is negative, it is termed a QS wave (not just a Q wave as you might expect). (S prime) waves if they are negative. And capital letters (QRS) are used to designate waves of relatively large amplitude and small letters (qrs) label relatively small waves . so always make it an habit even while discussing with frnds with capital and small !!!! SEE U SOON IN THE NEXT CHAPTER WITH REST OF THE WAVES! !